After an introduction last year, a slow trickle of information and a pre-order period of two weeks, Apple Watch is here at least. If you listen to the ravings on the Internet, I’m apparently one of the lucky few to score an Apple Watch delivery here. For all the other folks celebrating Christmas in April with a Apple’s latest piece of hardware, here are some first impressions of a few of the dozens of games already available for the device. 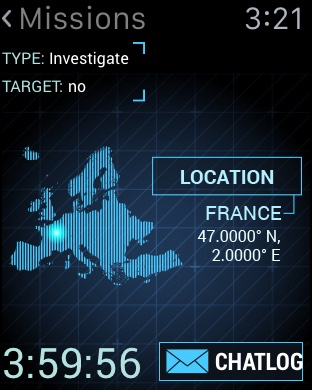 Spy_Watch, $0.99 – Spy_Watch ($0.99) by Bossa Studios was one of the first games that I figured up after getting my watch synced. As we mentioned in our preview a few weeks ago, the goal of the game is to tell an interactive story centered around espionage. After a fairly lengthy (for a watch game) tutorial that sets the stage of you being the son of a former head of a Spy Organization (that was mysteriously killed no less), you meet an anonymous individual that needs your help to rebuild the spy organization. In return, you’re promised answers as to who the people are that killed your father as well as the means to stop them. After the tutorial you’re immediately dumped into the main menu of the game in which you can go on missions to advance the story and/or earn money, and spend said cash to ‘train.’ I wish I could describe more but the first mission I went on immediately put a timer on the game of four hours with nothing I can do except wait. 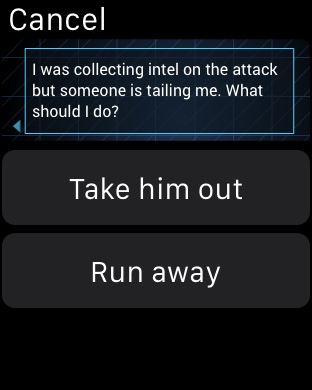 Being an Apple Watch game, I think the timer system will probably work well for short bursts but I think it would have been better if Spy_Watch provided a better tutorial explaining the mechanics (vice the in-game psuedo-tutorial that’s wrapped up in the story). I’m sure it’ll be a cool game but at this point, only time will tell. Letterpad - Free Word Puzzles, Free – Nimblebit’s latest word game not only successfully makes the jump to the Apple Watch but truly feels right at home on the little platform. If you didn’t get a chance to look at our release post, Letterpad (Free) is a cool little puzzle game that presents you with a tile of letters, a short hint, and the number of letters for the word that the puzzle is looking for. 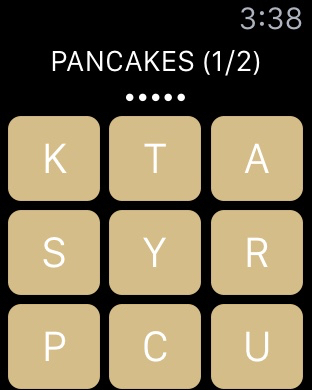 Your goal is simply to tap the letters in order to make said word, which lets you advance to the next puzzle. The game’s simple letter-based gameplay is a perfect fit for the Apple Watch screen and force touch options let you spend hints, shuffle letters and clear spelling attempts. The only minor annoyance I see with Letterpad for Apple Watch is the fact that the screen is a little small for all the letters, which makes the possibility for misspellings higher (I can’t imagine how this plays on the 38 MM watch). Clearing a misspelling requires a force press touch so while it’s not a huge issue it’s not as easy as clearing an attempt on the iPhone. 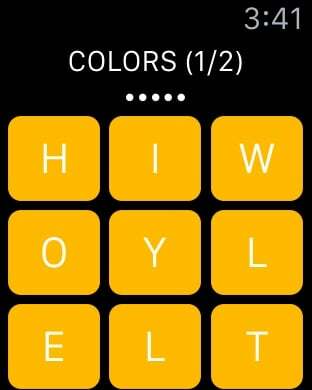 By far the best thing about Letterpad for Apple Watch is its ability to sync with the iOS app so you’ll always be on the latest puzzle you’re working on regardless of platform. This is definitely a game that I could see myself playing on my watch when I have a little time to spare so I’d certainly recommend it. Watch Quest! Heroes of Time, Free – Watch Quest is one of the more interesting games that I took for a test drive. While it is an Apple Watch only game, you need to use the iOS app to get started. The iOS app contains a variety of quests that you can push to your Apple Watch that all have a time limit. 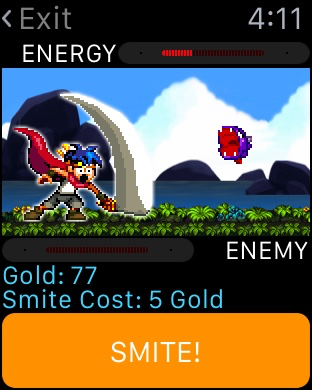 Once you’ve pushed a quest to your watch, you can launch the app on there and see your hero. From a gameplay standpoint, it sort of reminds me of an interactive Godville in the sense that your character is on auto-pilot for the duration of the quest but you can provide input into his actions in order to score more gold and experience. While on his quest, your hero will encounter an event every few minutes which can range from finding a treasure chest to battling an enemy. Having the game open on your watch when these events occur allow you to actually gain the benefits from them (for example, when a treasure chest is found you need to actually press the ‘open’ button in order to get the loot). 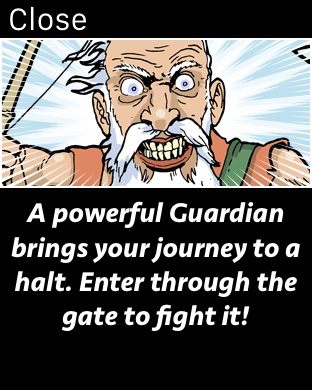 If you don’t open the app within a timely manner, your hero bypasses the quest and continues. 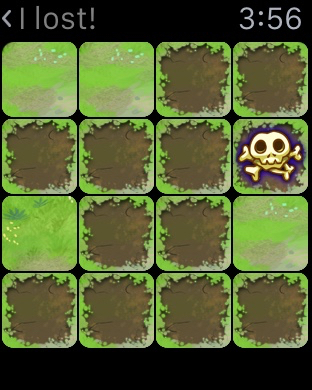 There are also some mini-games such as a simple minesweeper-esque treasure game that has you digging to find treasure while avoiding the skulls (which end the expedition). An energy system helps you manage your events as participating in each one takes energy (and the journey ends when you run out). Like Spy_Watch, Watch Quest relies on quick bouts of checking in with the game and using some buttons in order to get the most out of advancing in the game. The difference is I think Watch Quest is a bit further along in terms me actually wanting to check in with the game. The game is free to try and comes with a simple tutorial quest. The real quest pack is unlocked with a token which will cost you $.99 in IAP right now. Runeblade, Free – At first glance, Runeblade (Free) is a pretty simplistic RPG in the same vein of that genre of mobile titles where the majority of gameplay centers around your ability to tap over and over again to advance. 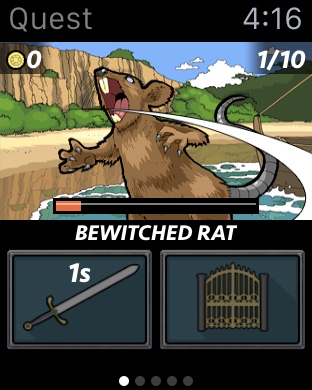 As soon as you fire it up you’re presented with an enemy to dispatch, tapping the ‘Attack’ button launches an auto-attack that continues until it is dispatched and a new enemy comes along (and so on). The reward for each victory is a small bit of gold that can be saved and eventually used to upgrade your damage and tap % (basically the amount of time/damage you can deal until you have to tap the attack button again). Completing quests unlock bosses, which put you in a timed race that tests your damage output (basically, beat them before they run again). Take out the boss and you unlock the next area with tougher enemies and more coin to be earned per victory. While the above sounds pretty simple, Runeblade does add a bit of depth to the genre with a wealth of items to unlock. The upgrade system I mentioned above is combined with the ability to unlock spells that is based on how far along you’ve upgraded your base damage. Sure, in the end all these upgrades go back towards the basic premise of dispatching enemies, but it’s probably the most complete game I played in terms of mechanics (too bad it’s lacking in terms of in-game story at this point). I was also pleased to see that it does capture some of that magic of wanting to come back and continue tapping on that attack button in order to earn enough coins for my next upgrade. Runeblade also has the nicest visuals i’ve seen so far on the Apple Watch, which at least offers me encouragement to keep coming back to it. If I were to state the recurring themes I’ve seen in the games I’ve played so far, it’s that each Apple Watch game puts an emphasis on quick gameplay mechanics combined with some kind of motivation to continually check in. A few of the games I checked out have some work to do in terms of the latter but it’s obvious that, at this point, the goal is simplicity in terms of gameplay. It all feels just like when the App Store first came out and there was a rush to put out simple games as fast as possible. Just as developers got clever in terms of their implementation I have high hopes that the same will be said for the Apple Watch App store in the future. Meanwhile, we’ll be checking out even more Apple Watch games in the near future.